work that night I decided to sign up. After I signed up it of course said it was suppose to rain. Maybe we would luck out. It didn't rain all day, but was very windy. It wasn't until we were driving to the race when it started to rain. We picked up our race packets and headed back to the car before the race started. While walking to the start I didn't have any expectations since it was rainy. I just wanted to get done. It was very crowded when we started. It took me a few minutes to get around other runners and get in a groove. Dodging over puddles didn't help either. There were some very slick spots, especially where the white lines were on the road and around the many corners along the course. If it wasn't for the rain, I think it would have been a nice course in downtown Norfolk and around the water. Since it was raining I didn't pay too much attention to my Garmin because I didn't want to keep pulling up my sleeve to look at my time. I did once and I thought I had a pretty good pace going so I tried to keep it up. I passed several runners and thought I was in a good place. If no one else passes me by this point I'll be happy I said to myself. 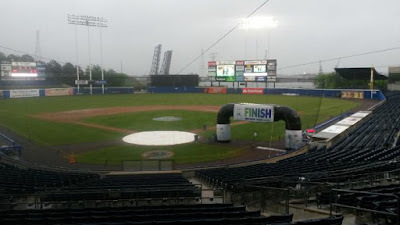 I knew I was close to the finish when I saw the Harbor Park Stadium. There was one lady that was ahead of me that I had my eye on. I wasn't sure if she was in my age group or not but I knew I wanted to pass her. So when we rounded the last turn I gave it all I had and ended up passing her. I received my medal and met my friend. We grabbed our free beer then headed out shorty. It's too bad it was raining, because it would have been a fun after party with a band and several food trucks set up. But by the time we finished it was raining pretty good and we were so cold that we just wanted to leave. Congrats on a great race. 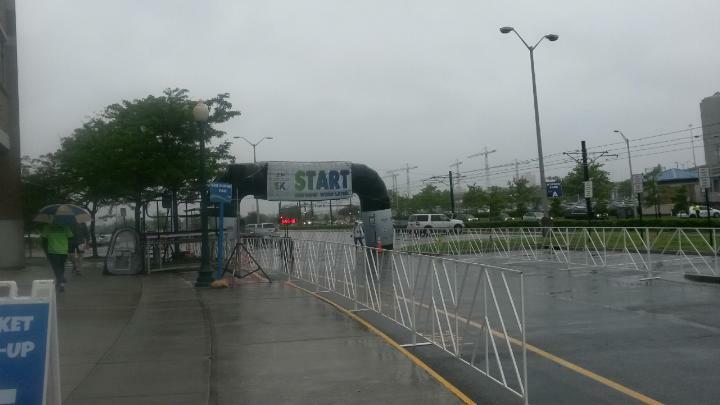 Running in the rain is not especially fun, but race day is full of surprises sometimes. The J & A races are always fun and this one had a cute theme. I think the after party would have been much more fun if it wasn't raining. Congratulations! 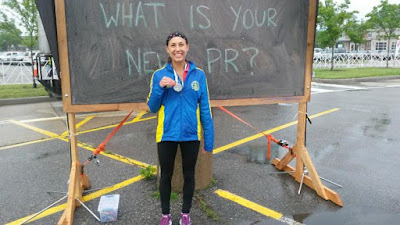 What was your time and did you get a PR? Thank you. It was 22:06. It wasn't a PR but close. It was a fairly small race so it helped me. Congrats on the fast time and placing - quite the accomplishment with the puddle dodging! Congratulations!! What was your time? Sorry, just being nosy ! Sounds like it would have been a fun race in better weather. Congrats on the age group finish! Congrats what a nice surprise to find out you did so well in your AG! Thanks. Yea I was surprised too. Congrats! That is awesome! I love that running clubs have come up with so many great ideas to have races! Thanks. This was an inaugural one. Another award- that's so cool! I know the race directors have to hate when it rains - all the planning & then no one sticks around for the after race stuff. Bummer. Thanks. Yeah it kind of stinks that this particular race series doesn't do awards right after the race. You just have to wait and receive it in the mail. Haha yeah. It would have been much better had it not rained the whole time. Congrats on the award. Rain certainly changes things, and I had to dodge puddles too on Saturday. I actually missed a dodge and landed in one :( but I don't think my shoe got too wet. That was the worse, dodging puddles. Luckily I didn't step in any big ones. Well poo on the rain but gosh it sounds like it would have been a great after party and all. Congratulations Lacey on getting 4th overall and an AG award, I wonder what it will be? Wow, congrats on the age medal considering you had a runny race! 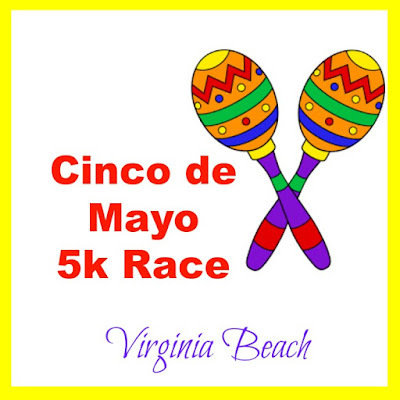 That's too bad that the rain tends to spoil the post-race festivities! Good job! Looks like a fun race! It's been a rainy spell! Congrats on a great race and the AG award! Rainy races are so tough. 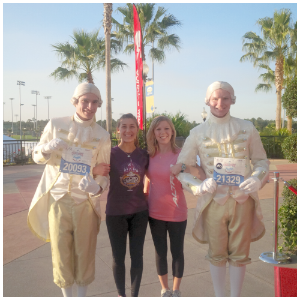 I love that you ran a race on a Thursday evening! Good for you for running even though it was raining! Congrats on the 4th place finish! Nice job on your race!! 4th place is a great finish! I love picking people off, whether they're in my age group or not. It's great motivation for the final kick! Congrats on the age group award! But boo to the rain. I'm so done with this weather! great job on 4th overall and 2nd age that is awesome!!!!! Congrats on a great race and 2nd in your age group! Its too bad you couldn't fully enjoy the post race food because of the rain. Congrats on placing in your AG, Lacey! That's super exciting! So sorry about the rain and nasty weather! You did great despite it all! Woah! Congrats! 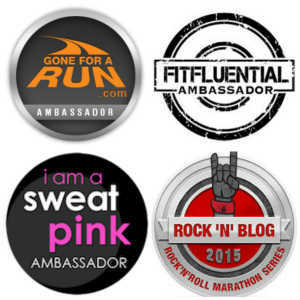 Sounds like you ran an awesome race despite the rain. What is up with all the rain we've been having?! Great job, Lacey! Congratulations and way to push through those challenging weather conditions!!! Can't wait for you to get your award in the mail, that is awesome!!! Congrats! Bummer about the rain, I love a good after party. Congratulations on your awards!! That's so awesome!!! Congratulations on 4th female in such drizzly conditions! Sometimes I like racing in the rain, but I feel bad for the race organizers if there's an after party since people usually leave as soon as the run is over when the weather is bad!